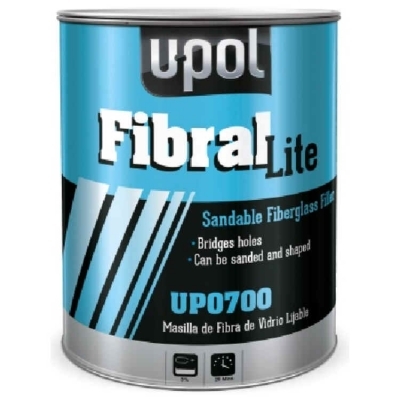 U-POL FIBRAL is a short strand fiber glass putty used for bridging holes in steel and fiber glass panels. U-POL FIBRAL putty forms a hard durable surface, however its short strand formulation enable it to be easily applied and sanded. U-POL FIBRAL has been specially formulated for the professional it can be top coated with putty or directly top coated with paint. Fibral polyester glass-fibre filler is a two-component chemical paste used for the bridging of holes and rust in surfaces such as bare steel. Forms a very hard, durable surface. Can be sanded and shaped if required. Easily covered with standard polyester filler or can be over-painted directly.